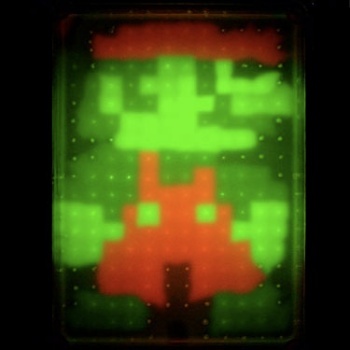 If you could engineer bio-luminescent bacteria to glow certain colors, don't try to tell me you wouldn't try to create Mario's iconic Super Mario Bros sprite. Let's say you were a member of a team that entered the International Genetically Engineered Machine competition (iGEM), and were given the task of creating art with biological components - specifically, luminescent bacterial cultures. What would you do? If you were a member of the team from the nanobiology laboratories at the University of Osaka, apparently you would shape said bacteria into the iconic sprite of the world's most famous plumber, as seen here. The bacteria are genetically engineered to "express fluorescent proteins and carotenoid pigments to create works of art," which is fancy science talk for "They make the bacteria glow pretty colors." The New Scientist has some more of the pieces, and while some of them are mind-blowingly gorgeous and impressive (I'm particular to the photo of Albert Einstein), none of them are Mario. So clearly, the Osakans win.